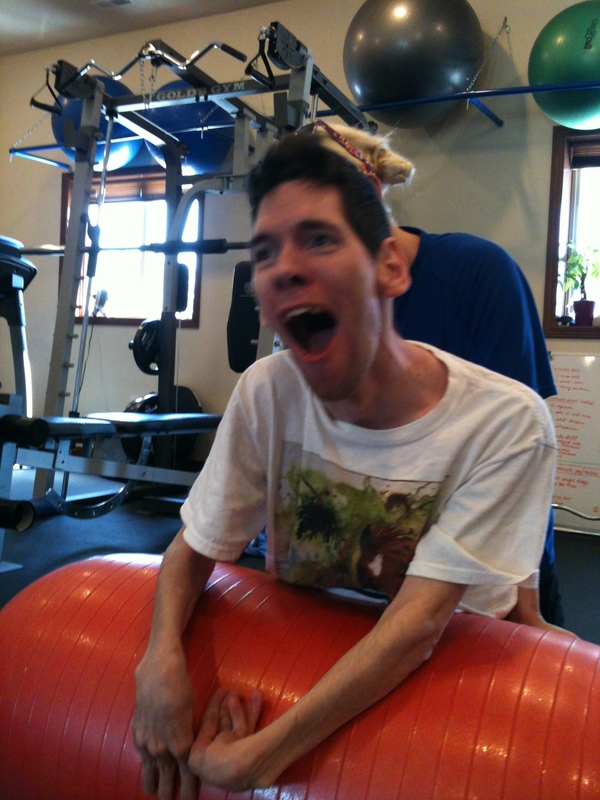 Josh has been working out for six months now. I thought it would be fun to see if there is any visible difference. 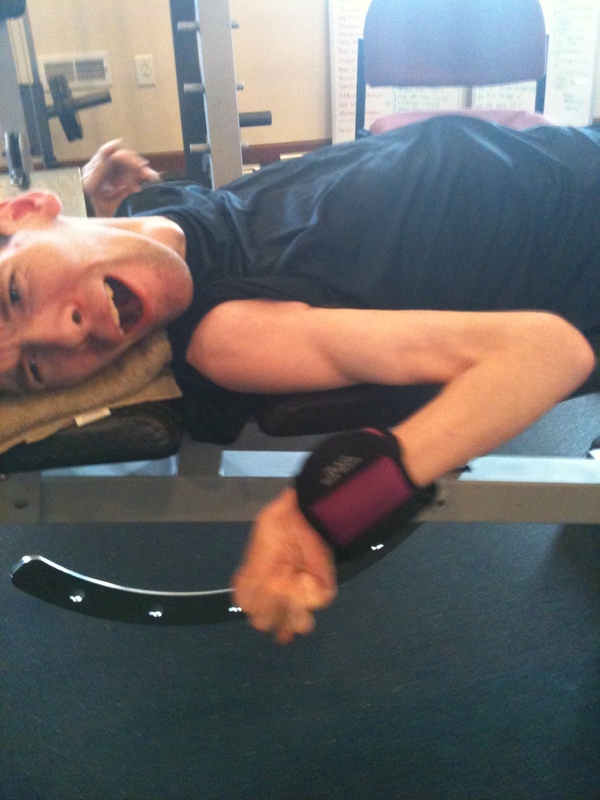 When Josh made the decision to work out I was surprised at his determination. Because he’s non-verbal he can’t always express to me his wants and desires. It honestly never occurred to me that he could, or would even want, to work with a personal trainer. When we withdrew him from the school system to home school we lost our support system. Lost the physical therapy and speech therapy. And for some reason it never occurred to me to go to a personal trainer. Even as open-minded, inventive, and supportive as I thought I was the logical route of going with a normal exercise routine simply didn’t enter my mind. I’m still trying to figure out why. I’ve never put limits on Josh so why did I not see the physical side? Was I brain-washed by the medical specialists that we saw over the years? I simply don’t have an answer. 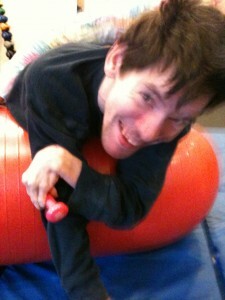 But Josh solved the problem by showing such eagerness and determination to get more physically fit. In the time Josh has been working at Riverside Chiropractic I see a decrease in uncontrolled reflexes. I see greater range of motion. Better muscle tone and greater accuracy in intentional movement. Josh’s confidence level has soared and he finally is starting to look his age. I went into this, as his mother and care-giver, with very few expectations. I hoped he would regain some of the range of motion he’d lost over the years. 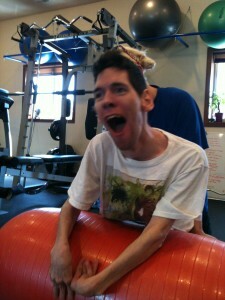 I don’t know what Josh’s expectations were but I see him go to his exercise workouts with joy. He loves them. He works hard. We have gained so much more than I ever expected my outlook has changed. The one element we lacked in the past is here. And that element is Josh’s own will power. He wants this. He thinks about it during the week. He comes into his work session with his own agenda. I have always believed in the power of the human brain. And right now, I’m just a bystander watching a young man put the full force of his own will to work. It’s an incredible journey. Tell Josh he is not the only one who gets tears in the eyes when it comes to family. I am right there with him. But, it is tears of joy. Right, Josh. Marilyn, thank you for checking in and leaving a comment.